I got a weakness for Golf games, I want to try almost all golf games simply because they are most likely easy to hop in and play. Naturally this also applies to this game, it’s an easy to play yet challenging game. I already said that I got a weakness for Golf games, this game is no different. But while progressing this game I noticed this game was giving me something special, something I have been searching for in sport 2D games for a very long time. What made this game interesting for me was having a character which had a really powerful swing but needed to work on his mechanical skills, this was said by the coach. After proving your worth the game takes you through a rich story full of adventure, humor and believe it or not… character progress in a way you find in RPG games. This is something a lot of gamers are looking for, what is more fun than seeing your character progress and get stronger over time? Sports game that will challenge you a fair bit. Adventurous experience, you will be able to free roam. A good sense of humor has been put into the game. Tournaments, are you skilled enough to take on your rivals? 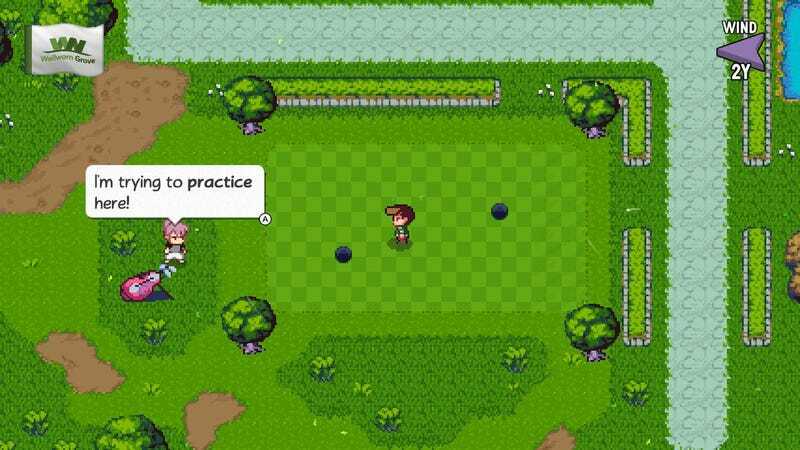 The game will teach you some rules and how to’s about Golf which are applicable to the actual sport. Obviously this game is about Golf and with Golf there are tournaments to win, you will need to do some pre-quests in order to be eligible to enter a tournament. What’s best about these quests is that they are always applicable to the terrain and conditions you need to play the tournament on. It can be windy, full of obstacles, sand, snow, water, rough and very rough terrain (you name it and it is in there). These conditions will challenge you to swing your club around the conditions to make the best out of the conditions you need to play with. Power: Affects the average distance of your drives. Purity: Affects how accurate/straight your shot will be when you hit the ball. Strike: Affects how much power your swing will have when you hit the ball. Ability: Affects how much spin your hit ball will have. Spin: Affects how much your ball spins upon making contact with the ground, in a positive or negative direction. In my opinion, there is no good or bad in using your skill points, I think you need to find out your playstyle and use them wisely so you benefit from it. I have enjoyed every second of my time while playing this game, it has also challenged me every now and then. It is not your typical Golf game where you try to slam the ball into the hole with the least strokes. This game will satisfy you in ways I cannot explain. This game costs $14,99 and is definitely worth the money, you can put so many hours in it and still have fun playing after you’ve beat the game. I would rate this game 9/10. Nice review! 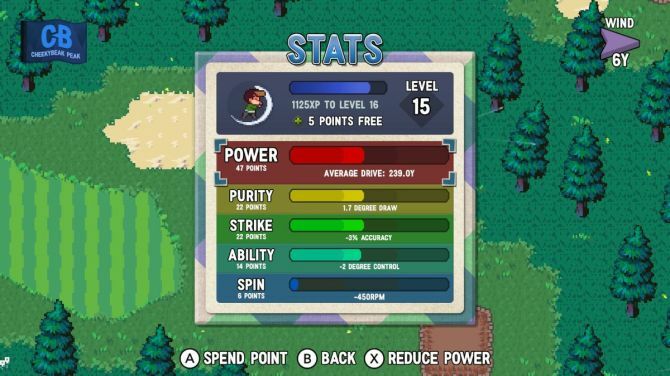 Golf Story looks cool and its good to know that there is character progression in the game. I may have to give this game a try lol. This is on my “to play” list – good to see more positive things about it. I hope you will enjoy the game as much as i did! It is definitely worth the money and effort! I was on the fence about this title, but the explanation of the progression system has sold me. Great review!